Normally you wait weeks to open your bank statements. But for some reason, this time, you tore into it. The pages with their spreadsheets felt heavy in your fingers. And somehow, when you unfolded them, this bird also unfolded. 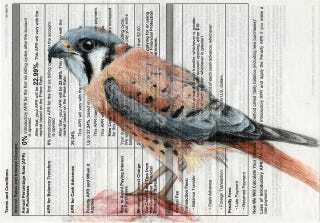 This is just one of the many incredible portraits of birds that Paula Swisher has drawn on her mail and other pieces of scrap paper. There is something stunning about seeing these birds' eyes looking out of the most mundane, throwaway artifacts we ever receive. It's as if your junk mail had suddenly become a portal fantasy. Visit Swisher's website to see the dozens of birds she's drawn like this, and be filled with wonder.